Place all ingredients except halibut in a small bowl and mix gently to combine. Lay halibut slices on a cutting board and spread the mixture evenly over each slice. Roll up, wrap in cling film and chill for 2 to 3 hours. 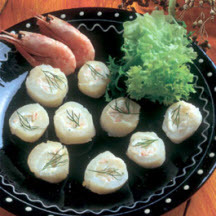 Slice the halibut rolls and garnish with dill. Serve as hors d'oeuvre, or part of a starter. "From sea to plate, Seafish delivers expert knowledge, skills and support which help the UK seafood industry secure a sustainable and profitable future." Recipe and photograph courtesy of Seafish, the UK Sea Fish Industry Authority www.seafish.org.